Building the Eun Mara "Skerry"
As you've reached this page, you probably realise that I enjoy building wooden boats. Having built two dinghies (see Background) I started building an Iain Oughtred "Eun Mara" design in 2003. 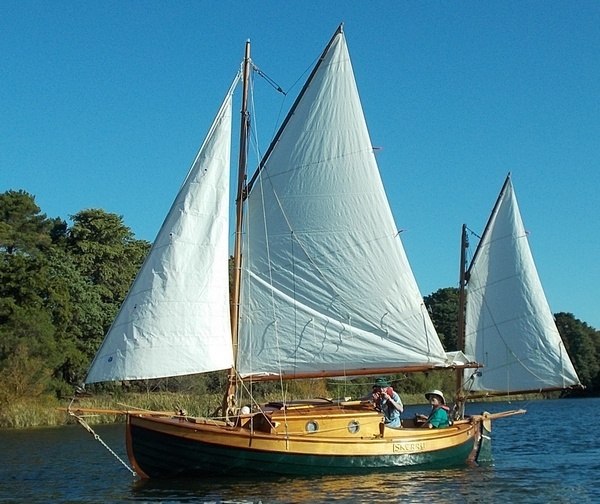 Eun Mara is a 6.1m (20') glued clinker ply canoe yawl that is described well in Dale's Alistego site. I've created these pages in order to share my building experiences with like-minded people, particularly anyone who is building a Eun Mara. I'll update the content as time permits. I'm located in Canberra, Australia. The construction is taking place in half of my garage and, as you will see if you visit some of the other pages, space is limited. I don't pretend to be a very experienced wooden boat builder, and certainly don't present these pages as a "how to" guide! I find it interesting to see how different people approach things in different ways, and I hope that my contribution at least broadens the pool of information available to Eun Mara builders. If nothing else, there might be a section on "Pitfalls of building a boat in a confined space"! I recommend Dale's Alistego site to any prospective Eun Mara builder. Dale's pages have been a valuable reference during planning and building - "thank you", Dale. My name is Richard Almond. Please feel free to contact me with comments, questions, or just to chat, at ralmond@geoss.com.au. Dale has kindly set up a Eun Mara builders' discussion group. Bob in Portland, Victoria, Australia, built Morna in a seriously enviable workshop and launched in May 2015. Click here. Alec, near Bermagui on the South Coast of New South Wales, Australia, launched Heather Mary in early February 2007. Click here for the photos! Ron, yet another Australian builder, constructed Lizzy 2 in Sydney and launched in March 2009. Click here to see the turning over, and some of the novel construction techniques he has used. Edwin is building de Notedop in the Netherlands. Click here. Here is a link to the Traditional Boat Squadron of the ACT (TBSA) for those who might be interested in boating in Canberra. Skerry's trailer was designed and assembled by Trailer City in Rydalmere, Sydney. I found them helpful and easy to work with. The trailer has been much admired and so far has proved very serviceable. I had initially tried Southcoast Trailers in Nowra, which is relatively convenient for Canberra, but at the time they were unresponsive to my inquiries. However they are now under new management and I have heard good reports from fellow boaters. Bold Trailers in Caringbah, Sydney, specialise in trailer repairs, modifications, and renovations.